The public library is the greatest thing to come out of civilized society. As a child, the concept blew my mind. I get to pick any books I want? Then, I can bring them back and pick more? This love affair has continued long into adulthood and today, I’m a proud Friend of the Library. One of the bonuses of supporting the public library is early admission to the library book sale. It’s a biannual affair which culminates in Five Dollar Bag Day — all the books you can fit into a paper bag for $5. I look forward to this more than my birthday, Christmas, Thanksgiving, Valentine’s Day and Red Cup/Seasonal Winter Beverage Day at Starbucks. Every year, I come home tottering under the weight of paperbacks and due to this obsession, we’ve run out of shelf space and have books stacked all over our apartment. One of my 29 Before 29 Resolutions was to donate my old books and today, I went through the stacks. 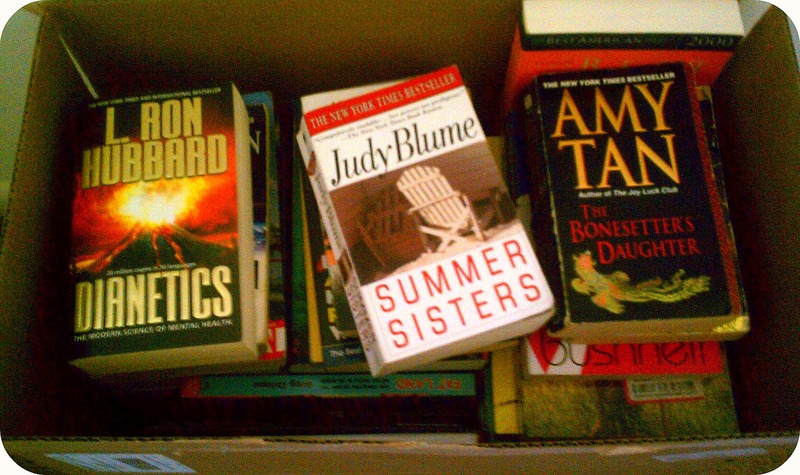 Augs estimates that the box of books weighs about 30 lbs. Of course, we still have a pretty sizable library. This is only about half of it and in three weeks, I’m going to come home, arms trembling under the weight of a paper bag stuffed with paperbacks. But for right now, #25 can be crossed off my list. One down, 28 more to go. « I Still Haven’t Found What I’m Looking For, Or The Googles! They Do Nothing! My comment isn’t nearly as nice. But that picture on your shelf is when you poked me in the back and ruined a perfectly nice photograph! Why is that in a frame?! Also, I love the library, but Alex may have ruined it for me. Remind me to tell you why later. That picture is awesome and exemplary of what a mature older sister I am. Also, we both look skinny and cute. Also, GROSS. Why did you tell me that? Damn you Alex and your penchant for honesty. It’s probably like a really high number too. Like 60% of all books. Whatever. I found $20 in a Raymond Chandler book once and nothing will ever dissuade me from using the library. Well I see your problem right there: you have a pathetically small bookcase. BRING ON THE SHELVES! Damned Ikea! In fairness, though? 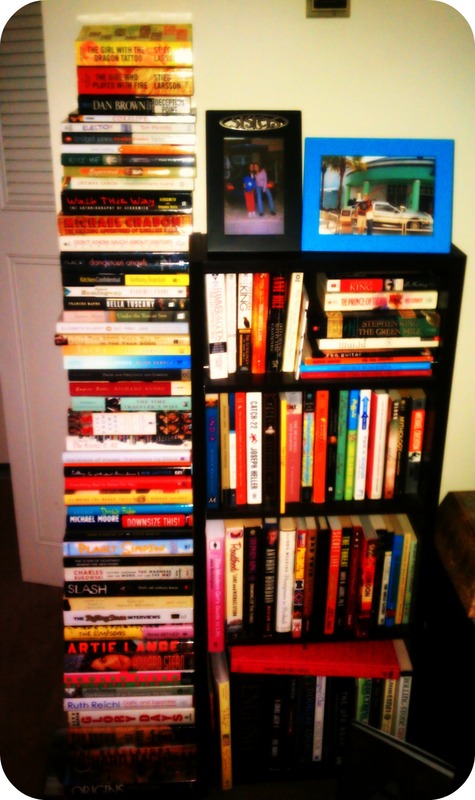 This is our small bookcase. The bigger one is on the other side.